Second, runner up, losers to Victoria, that is where the NSW State Team came in this year’s Interstate Cup (ISC) held in Hobart. On most occasions this result would send you home feeling down, failed, and wondering how to beat Victoria. But this result was the strongest showing from a NSW team in 12 years, and we came home with heads held high. We can go into next year’s campaign with confidence and higher aspirations. Easier said than done, for those who have competed or spectated at the ISC since 2001 with the new format will realise how difficult it is to get 8-10 players to peak and perform at their best. So why did NSW improve from 5th to 2nd, with, on ranking, a weaker team than previous years? A very cohesive team unit who were hungry and motivated. All players played to their potential and some rose above expectations, and we handled pressure better than other years And luck – we finally got the rub of the green to fall our way. In most sports when the desire is strong luck seems to go your way. To get a good result next year we need to still improve on performing under pressure, That means the players have to get out there and compete against top competition in NSW and out-of-state events. So please support the tournaments and get out there and challenge the players and push for team selection, because it is (as the English have described it) the best and strongest National team competition in the world. My thanks go out to all the team who were: Rosemary Graham, Chloe Aberley, Claire Gorton, Lorraine Leblang, Christine Pont, Nerida Taylor, Stephen Richards, Steven Harden, Tony Hall and Nick Chapman, the squad players of Jonathan Bowen and Dennis Faggotter who pushed the players at team practice and Stephen Meatheringham who provided coaching to the players. The team thanks the support from the Executive and the much needed support on the sidelines from Geof and Jacki McDonald, and Michael and Barbara Bidencope. The game is played on a normal Croquet green or a suitable level grassed area. Double or single games of 13 hoops are played with the winner of the toss playing first with the Blue ball, then play continues with alternate strokes in the order blue, red, black and yellow. When hoop one has been negotiated by any one ball play then moves on to the next hoop in order through the remaining twelve hoops have been played. The score is recorded on a card by one player, recording the number of the hoop successfully negotiated under the name of the player responsible for the ball which passed through the hoop in the correct direction and order. Standard Association hoops, balls, mallets and centre pegs are used with halfway indicator pegs on the boundaries showing the halfway lines between hoops 1 and 2, between 3 and 4 and also between 4 and 5 and 1 and 5 and also between 6 and 2 and 6 and 3. Each turn consists of a single stroke. If the ball is touched by the mallet whilst preparing to strike it is a fault and the turn ends. If any ball is touched in any way by the striker, other than when striking his own ball, he has committed a fault and his turn ends (this includes playing a wrong ball). Any ball or balls moved as a result of a fault shall be replaced before the next stroke is played. Any stroke causing damage to the green is a fault and balls moved are replaced and turn ends. An air swing or failing to hit the ball when making a stroke is a fault and the turn ends. If playing out of turn has not been noticed before the next ball is played no action is taken and play continues as if it had been that player’s turn. If the mistake has been noted beforehand the ball concerned is replaced and no penalty incurred. If a ball moves again after it has come to a stop it remains where it is unless the next player had played his stroke before it moved in which case it will be returned to where it originally stopped. A hoop has been scored when no part of the ball is protruding from the playing side of the hoop. If the ball enters the hoop from the non playing side it must be clear of the hoop on the playing side when it comes to rest before it can be subsequently played back through the same hoop to score. If two balls run the hoop in the same stroke the ball nearest the hoop before the stroke wins the hoop. No hoop may be scored as a result of a fault. In doubles play a partner may advise his partner on how to play his stroke but must stand clear during the stroke. If a moving ball is interfered with in any way the stroke should be replayed. If a stationery ball is moved by interference it should be immediately replaced. After a hoop has been scored the owner of any ball, other than the scorer’s ball, which is past the halfway line to the next hoop in order must ask the striker whether their ball may be played from where it lies or, if not, which penalty point it is to be played from. If a player, other than the striker, comes into accidental contact with a ball under any circumstances the next ball to play on that person’s side forfeits its turn and any ball moved is returned to its position. If the contact is the result of a stroke the stroke should be replayed. The game should be played in a relaxed and friendly atmosphere to gain the maximum benefit from its social interaction. Your comments as individuals and at Club level would be greatly appreciated. A week without a worry! This event, combining croquet and a touring programme, will be held in the Urunga area of the North Coast in the week commencing 30th October 2005. An explanatory brochure and entry form will be mailed to all clubs this month. The Urunga lawns are in a picturesque setting on the banks of the Kalang River. There is a good range of reasonably priced accommodation within walking distance of the lawns. The croquet programme will provide about one game per day commencing with an Egyptian event on Sunday 30th and concluding with a golf croquet day and barbecue as guests of the nearby Sawtell Club on Friday 4th November. Beautiful and interesting tours have been arranged for each half-day except for Wednesday when there will be a full day’s outing to Grafton, combining lunch and a boat excursion on the Clarence River. Jacarandas and Silky Oaks are at their peak in this week. The whole area is ablaze with blue and yellow colours, truly one of the State’s glories. The touring programme has been chosen to see the best of this display. The cost of $170 includes croquet, tours and some lunches and afternoon teas as described in the brochure. Maitland - Australia Day Golf Croquet Carnival (2004 rules 13 point games) This was a very well run carnival with most games single banked. I must, at this stage convey my thanks to Robyn Wallace for her generous provision of hospitality to both my husband and myself as referees. She also provided hospitality to many players who attended the carnival. This carnival went like clockwork from start to finish. The use of scorers for the double banked games was well thought out, but some confusion did exist regarding what hoops had been run. Of course, spectators needed to watch the entire game to be able to determine the winners. All games were played to the rules and no problems occurred with the second game starting after the first 2 hoops had been run. Young’s Inaugural Golf Croquet Carnival, 19 - 20 March (2005 rules 13 point games). Again, this was a very well run tournament. This time players carried their own score cards - Referees were, for the most part on call. This system worked well but there was hesitation to move from the hoop scored until the cards were marked. Well done Young, a very full on carnival. At the conclusion of this carnival Tony Hall produced a bundle of plastic clothes pegs as a suggestion that this would both speed up the play and let spectators know the state of the game. NSW State Golf Croquet Championships at Tempe, 2nd to 7th April (2005 rules - 13 point games) For these events (doubles & singles) I purchased Jumbo clothes pegs from a Reject Shop - bags containing blue, red, green & yellow pegs To obtain another secondary colour, they sold blue and white in small trays. Each side was equipped with 6 pegs of their appropriate colour and not only did it speed up the games but spectators could readily see who had scored hoops. The only drawback was that with constant use some pegs came apart. I remedied this by twisting a rubber band over the spring section of the pegs. A very successful and hard fought tournament, purely Golf Croquet players showing that they could mix it with the Association players. Muswellbrook Golf Croquet Day, Monday 11th April (2005 rules - 7 point games, played on 2 well proportioned half courts) There were 12 doubles teams, and each team played 4 games. Glenda Downs and her supporters did a magnificent job of organising this day, the catering was faultless. As Tournament Referee, my husband and I were hosted by Marie Guest. Robyn Wallace again providing us with the Saturday night’s accommodation as we wanted to arrive early on the Sunday before, to give some instruction on the new rules and to trial the 7 point game. Very well done Muswellbrook. This is where the pegs I had purchased, proved invaluable as waiting players and other spectators could easily see the state of the games. I believe, that after all the use these pegs have had we may have lost one spring. VCA headquarters in Brighton recently hosted the inaugural Australia ‘A’ versus New Zealand ‘A’ Trans Tasman test series. Held over three days, this test series is a new initiative designed to give international experience to those “uncapped” players who have the potential to later represent their country. The first day began slowly with all players trying to find some form, but the Aussies snuck out in front after the doubles 5-3. Several of the singles matches were pegged down over the first night, with only a couple of games being completed before night fell. The Aussies came out with a bang on the second day with all of the girls winning their first and second round of singles. After a strong day, and two more games being pegged down over Saturday night, the Aussies had won 16 matches to New Zealand’s six meaning that Australia needed only one more match to seal the victory. The Kiwis came out with guns blazing on the third and final day playing some amazing croquet but being unable to deny the Aussies the victory. The Australians eventually won the test 21 matches to 11. Good croquet was played by all with triple peels completed by Ian Bassett (1), Ken Bald (1), Alan Sands (2), Kevin Beard (3), Chloe Aberley (1) and Paddy Chapman (3TPs, 1TPO). The next Australia ‘A’ vs. New Zealand ‘A’ test series is scheduled for 2007 in New Zealand. Special thanks to VCA for hosting the event, the numerous volunteers and all those spectators who came to support the home team. At a recent morning tea break at the Port Macquarie Club, Mrs Hilda Banks showed all and sundry a photo of herself aged nine (right), in 1929, holding her own croquet mallet. 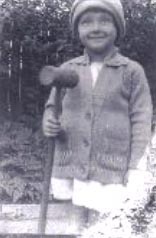 At that time, her home in Glebe Point in Sydney, had a croquet lawn as part of its back yard, and her training in croquet started two years prior to this photo being taken. On March 18 and 20 Mosman C.C. was delighted to host the visit of Mr Endo (Executive Director) and Mr Jun Nogami (Section Chief) of the World Gateball Union to discuss the upcoming Australian Gateball champs at Mosman and the promotion of Gateball in Australia. Creina Dawson (President of Australian Gateball Promotions) also represented the interests of ACA, which, it was agreed, was the over-seeing body for the International Gateball Tournament to be held at Mosman in November this year. Keith McLeod (National Gateball Director), Neil Hartley (Croquet NSW State President) and Elizabeth News ( NSW State GB Coordinator & Manager of the 2005 November Tournament) made up the complement of officials. Friday was a day for serious discussion, with many administrative matters being clarified (with the help of Fumiko, the very charming translator who accompanied Mr Endo & Jun) including the standards required by the World Union for qualification of Australian Gateball referees to International & Gateball Union standards. Sunday was a hoot. The sky spat a few drops on us and then gave up, and about 20 folk enjoyed playing Gateball, with Jun & Keith offering comments on our playing and refereeing skills. At lunch time Mr Endo & Jun tucked into pies made by Rosemary News who will be in charge of the catering for the Oz GB Championships in November. The rest of us had to bring our own lunches, which, if I might say so, with the smell of warm pastry wafting around the clubhouse, was definitely a foul! Or, in Gateball terms, Hansoku! After lunch our games got a bit more serious, though I still noticed Mr Endo, who played and kept score, and Jun, who refereed, laughed and clapped in appreciation when they saw devious and lucky things being attempted by our team leaders and players. For those who have never played it, Gateball is a team sport. A team consists of five players, who play their own numbered ball in strict order and follow the instructions of their team leader. It is fast, furious and a lot of fun. Ten seconds to make your shot, the strategy is fiendish and the referee is in total charge. Unusually for a city council its name does not reflect its surroundings. The city of Holroyd was formally known as ‘The municipality of Prospect and Sherwood The name was changed to Holroyd on New Years Day 1927, to honour the name of Arthur Todd Holroyd, the first mayor of the municipality. The present council chambers are now in Memorial Avenue, in remembrance of World War II. Statistically the city is 25kms from Sydney’s CBD and in 2001 had a population of 90119. The area f the municipality is 39.25 sq kms. The major city controlled by this council is Merrylands. (2003, Holroyd Council) This is a thriving city with good modern shops and also two large clubs, Merrylands RSL and Merrylands Bowling club. These provide sporting activities for men and women in well-kept grounds. Alas no croquet was available till 1994. Here it is interesting to divert to A.T. Holroyd himself. He was recognised as an ‘English gentleman’. He was qualified in medicine, then moved to the Bar, spending some time as a court judge, Master of equity and Member of Parliament for Parramatta. At this time there were many very large houses in the surrounding area and families like the Mac Arthur’s and Rev.Marsden were examples of proprietors of these homes. Their interests lay towards merino sheep and agriculture. Holroyd however turned to manufacturing (infra dig), where he found on his property some very suitable clay. From this he made bricks, tiles and drains. An example of brickwork using the original bricks has been constructed at the Merrylands railway station. With his brick industry he was thought to influence the construction of the railway station at Merrylands and the making of a road from the station to the brick pit itself. On estates like Holroyds, the affluent created games for themselves and their equals. Holroyds first game of bowls was between those educated at Christ College Cambridge and a Scottish team. His rules emphasised that the game was for skill rather than sport. (Karskens, 1991). Holroyd’s house (Sherwood Scrubs) is now used as a retirement village and a girls’ high school. Reverting to the present council, in 1991, Cr McNeill requested an investigation for the possible installation of a croquet club. The council decided to have a public meeting to establish support for the croquet facility and club in Holroyd, which was held on 18l November 1992. 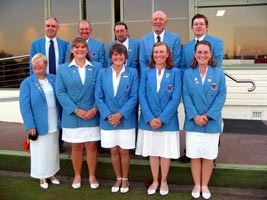 A Steering committee was set up to direct the establishment of the club in Holroyd. Dr.Keith Rienits who is president of the Croquet Players Association (CPA) attended the meeting. There was regular liaison between the steering committee, the council and the CPA. Strong support existed for the croquet club in Holroyd because there were no croquet clubs between Strathfield and the Blue Mountains. Plenty of croquet players offered to assist the committee. The council investigated the three nearest croquet clubs, Epping, Eastwood and Cheltenham, Parramatta and Ryde councils maintain Epping and Eastwood clubs, Cheltenham club which is owned by Hornsby shire council is operated and maintained by the Cheltenham Bowling and Recreation club. (1994. Resume of Mayors speech.). The committee worked very hard, writing letters to schools, newspapers and other facilities offering free lessons in croquet. Also many croquet players from other clubs offered their support and time. By 1993 the parks improvement programme had provided the council with $25,000.00 for the construction of the facility. The facilities in the Jones Park available for the Holroyd Croquet Club (HCC) were; A community hall (which is frequently used), amenities, and a pensioner’s room, which could be used as a clubroom, as it was under-utilised at that time. 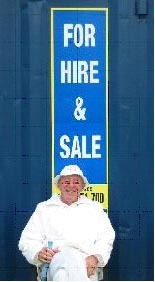 The HCC advertised successfully for mallets and balls. A refrigerator was given to them and a member of the committee made a trolley to convey the equipment to the court. Although fences are not essential around a croquet court, they were constructed at the HCC to separate the car park from the court. Sadly on the 21st of April 1994 Willy Sultana, a contractor of 20ys with Holroyd Council was working on final preparations for the opening of the court, when he collapsed suddenly and died. Mr Allan Ezzy opened the club on the 23rd of April 1994. Many people attended the opening, and there was an exhibition game. (Continuum of council papers). In the first two years of opening, the club was well attended. Shortly after, there was a fall off in attendance, however new members have continued to joined the club and other members have transferred from the Cheltenham Club. The current membership is stable. All the members of the club are hard working and the committee has maintained the goals of the founders, this has been shown in their work on game days and gala days, which have been entertaining. The Makara competition which is an open competition for all croquet players has been won by three Holroyd players. The court is open three mornings a week (Saturday, Monday and Thursday) and on Thursday afternoon senior pupils from a nearby school play a game under the supervision of one of the members. The Holroyd Croquet Club is grateful to the Holroyd Council for its continuing help. From 1 July 2004 the Level 0 coach qualification has been redundant. Those Level 0 coaches (CNSW Beginner Coach) wanting to retain a coaching qualification have to upgrade to National Coaching Accreditation Scheme (NCAS) Beginner Coach. The upgrade takes a morning, including demonstrating a knowledge of break play, and the rest of the day is used to train the coach how to integrate the new member into the club. The new BC qualification consists of a five hour course with an assessment conducted at least two months after doing the course. This allows the trainee coach to practice on friends to become familiar with the content of the initial lessons, and with how to impart the necessary skills to newcomers. Four players have done the new course. Neil Hardie of Cammeray is the first to complete the assessment. Regional Coaching Coordinator for the Northern Metropolitan Region, Elaine Goggin, did the assessment and presented Neil with his badge. Noel Moore, one of the BCs doing her Level 1 coach training, reported on a successful day at the Forster High School Sports Expo. At least 400 children had a try. There were 18 mallets, 16 balls, practice ‘hoops’ (made with corner pegs), and real hoops on two lawn areas on the high school playing fields. Croquet received top publicity on Prime News as the ‘favourite exhibit’. The school is interested in having croquet as a selected sport for a small group of middle school children. They have joined the club, so what next? Having spent over two years training players to become coaches of beginners, we are now grappling with how to integrate the new players (taught single ball strokes, take offs and circle hoop approach) into club play. Beginner Coaches are expected to continue coaching and mentoring the new players for up to six months after their students join the club. This is why BCs should only teach two or three newcomers in each group. They are expected to organise and conduct further coaching of, and play games with, the newcomer once they join the club. A BC can usually successfully teach and integrate two or three newcomers into the club each six months. Lucky is the coach who has a number of club players who can play the game the way the coach is trying to teach the newcomers, and who are willing to assist with the integration of new players. Lucky is the coach who has these and other role models (those who play the game the ‘text book’ way but do not wish to play with raw beginners) for the newcomers to observe and play amongst. There are few clubs where a new player can observe players doing triple peels or even making long breaks, on the same day the newcomer is also playing. How do clubs integrate new players? What should NOT happen is for the new players to be put in with those with handicaps 16 and above, with no access to ‘better’ players. This becomes the blind leading the blind. It retards the learning of those who could improve at a reasonable pace, limits the learning of those who can benefit from quality coaching, frustrates some who then drop out because they are not progressing, and does nothing to improve the play of the 16+ player. Usually the 16+ player has this handicap as they are the victim of the same process. Clubs need to consider limiting their recruitment to a pace where the new members can be integrated into club play before the next small group is started. There are currently very few clubs with this ‘problem’. The problem of new players not getting sufficient coaching because the coach is spending all their available time on newcomers just accentuates the problem of having a club with a large number of players with high handicaps. Players need continual coaching so they then become the tutors of future groups. This means the coach has tutors who can assist with integrating new club members into playing the desired form of the game, i.e. break play using bisques to get breaks going and keep breaks going. The new player needs a mixture of experiences. They need continuing ‘formal’ coaching, short sessions combined with practice or coaching games. e.g. Scarborough, 10 points or 14 point games, a bisque a turn, modified full bisque. It is best to do this on a club draw day. 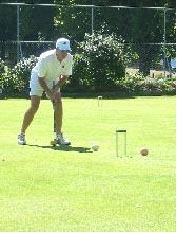 New players need to allocate their croquet time to times when they will play in weekly club draws. They also get to meet other club members so integrate faster. Alternate these coaching sessions with going in the general draw for a couple of months. They need to play Hi/Lo Doubles with players who can play the way you want the new player to learn to play. The coach may need to spend time training the ‘tutors’ to ensure that they are passing on the same basic information as the coach wants the new players to learn. The ‘tutors’ need an understanding of what the new player has been taught so coaches and tutors do not confuse the player with conflicting advice. They need to play Singles with their peers, preferably with a tutor on hand for some of the game. They need to start thinking for themselves. One turn-off is always playing Hi/Lo Doubles where the ‘better’ player makes all the decisions. After a few months the new players and others on handicaps 18 and above could have their own mini tournament. Games can be 10 point (when the first ball goes through hoop 1 put the partner clip on hoop 5) Singles games with bisques for all players no matter who they play. Some basic coaching of how to use bisques needs to be given. Those on 24 have 10 bisques, 22 have 9, 20 have 8, 18 have 7. Games are short, 75 minutes is suitable. It should be run on one day. There should be a mentor to each court who can advise (if asked) during the game and give a few tips after the game. Recognise the winner of the day with a small prize. The earlier players are introduced to meaningful competition the more likely they are to enter into club competitions. Having said all of the above, coaches are not expected to be ‘on tap’ 52 weeks a year. The ‘ideal’ for an active club of 20 to 30 players is to have two or three BCs and a Level 1 coach. The BCs would coach and integrate two intakes a year if the demand was there. The Level 1 coach would run four to six consecutive one-hour sessions for improvers and intermediate players twice a year and give informal sessions at other times. All coaches should ensure that the other players understand when they have their ‘coach’s hat’ on, and when they have their ‘player’s hat’ on.